1980 - 1987 Freelance Journalist for UK, Australian and USA Based Windsurfing Magazines, 1995-2005 10 Books produced - Kanu Culture – Outrigger Canoeing International Handbooks, 2003 Produced Level One Coaching Manual AOCRA Ratified by Australian Sports Commission, Australian Institute of Sport, Australian Canoeing 2005-2007 Produced Kanu Culture Ocean Sports Magazine with Sydney based Publisher 2006 Released, The Art and Skill of Steering - Outrigger Canoeing Book 2007 Released, A Paddler’s Guide to Outrigger Canoeing Book 2010 Commissioned to write Adventure Activities Licensing Authority UK SUP Good Practice Guide 2011 Commissioned to write Level Two Academy of Surfing (ASI) Australia SUP Exposed Waters Course Content 2011 Commissioned to write ASI SUP Water Rescue Course Content 2012 Released, Stand Up Paddle - A Paddlers Guide Book 2012 Commissioned to write Level Three ASI SUP Downwind Course Content 2013 Co-founder of the Water Skills Academy UK 2014 Released OC1 - A Paddlers Guide Book and Released V1 - A Paddler Guide Book, Winner of World Paddler Awards for Media 2015 Admitted into the World Paddle Academy. Steve West is one of the world's foremost ocean sports writers, educators and ocean sports athletes, a career spanned across some 40 years, as a professional windsurfer during some of its foremost pioneering days, some 20 years involvement with the sport of outrigger canoeing throughout the Pacific, as a writer, researcher and competitor and for the past 10 years a full time involvement with stand up paddle boarding. Living for 26 years on Australia's QueenslandSunshine Coast, world famous for its ocean sports and sports men and women, Steve has been fortunate enough to live amongst some of the world's most accomplished ocean sports paddlers and surfers. 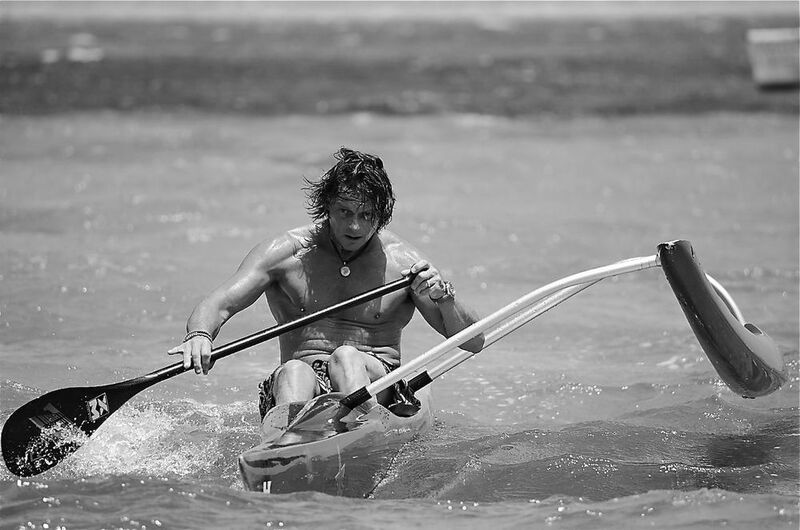 He has been a team member (outrigger canoeing) with such names as Grant Kenny, Australia's most famous Iron Man and multiple Molokai to Oahu surf ski winner, Jamie Mitchell, the world's best ever paddle board champion, Travis Grant, Chris Maynard and many other worldclass ocean athletes. Together with wife Mandy, Steve continues to write for a variety of sources including mistral.com along with design and procurement of water sports equipment and as a mentor and advisory to the water sports industry. Since 1994 he has devoted his time to the development of Outrigger Canoeing throughout the Pacific. Ten books later, he is considered a world leading authority on the subject, writing the worlds first outrigger canoeing coaching manual and was Australia’s National Coaching Director for five years and Fiji's National Coaching Consultant to the South Pacific Games Squad for 6 years. He has twice won the world championship Masters division of the prestigious 66km Molokai to Oahu, Molokai Hoe race and the Hamilton Cup International event on numerous occassions and remains a record holder in the 16km and 500m team events. His focus now is on the development of Stand Up Paddlingboarding in the UK and Europe, bringing with him a wealth of knowledge of open ocean canoe sports. He is a former RYA and IWS senior instructor and UKBSA open water examiner. As one of the UKs pioneering windsurfing professionals during the late 70s early 80s, he worked extensively in the promotion of windsurfing demonstrating at London, Brighton, Southampton boat shows, water sports events, appearing on TV and radio, contributing regularly to magazines, technical articles, equipment testing and reviews and was a member of the British Boardsailing Display Team. Finishing as Britain's 2nd highest place getter at the Bacardi World Cup in 1981 in the Freestyle event and highest finisher in the Ins and Outs event, Steve's preference was for wave sailing without rules. Traveling to Lefkas island in Greece in the early 80s he provided a feasibility study to create what is now one of the largest windsurfing holiday centres in the world, Club Vassiliki. He moved to Australia in 1983 to further pursue his windsurfing career working for magazines, sail makers and event organizers. In 1983 he was the Australian National Freestyle Champion. He has raced and paddled in some of the world's toughest outrigger canoe events and has worked extensively with Tahiti Tourism, Fiji Visitors Bureau and the Travel Associations of Palau, Guam and Saipan and with Australia's Hamilton Island Resort Management over 14 years in the development and promotion of their International Outrigger Canoeing event. First windsurfer to sail on the River Nile. Former Secretary Australian Outrigger Canoe Racing Association. Former International Polynesian Canoe Federation Delegate. Has raced in these events either once, twice or on multiple occasions.